Flores Island and Corvo Island to its north are located far west of the rest of the Azores islands and are the only two Azorean volcanoes lying west of the Mid-Atlantic Ridge. Growth of an initially submarine volcano included Pleistocene explosive activity associated with formation of small calderas. The 10 x 15 km island of Flores is dotted by numerous pyroclastic cones and craters. Following a long period of quiescence beginning about 200,000 years ago, several young phreatomagmatic craters and associated lava flows were erupted during the Holocene, including two about 3000 years ago. The Caldeira Funda de Lajes tuff ring formed about 3150 years ago, accompanied by a lava flow that traveled to the SE, reaching the coast at Lajes. The Caldeira Comprida tuff ring in Caldeira Seca, west-central Flores, erupted about 2900 years ago. It produced a lava flow that traveled NW-ward and reached the coast at Faja Grande. Azevedo J M M, Ferreira M R P, 2006. 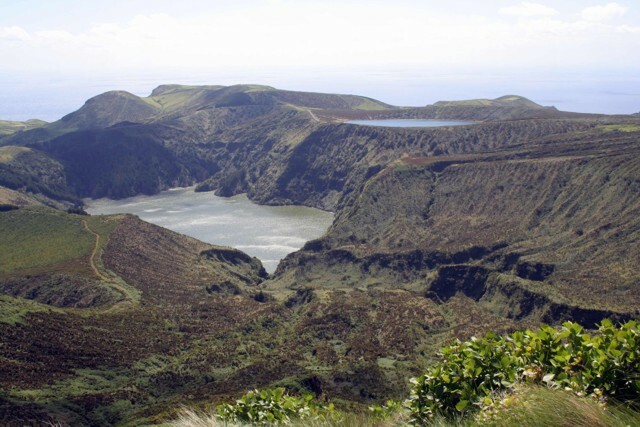 The volcanotectonic evolution of Flores Island, Azores (Portugal). J. Volcanol. Geotherm. Res., 156: 90-102. Morisseau M, Traineau H, 1985. Mise en evidence d'une activite hydromagmatique Holocene sur l'Ile de Flores (Acores). CR Acad Sci Paris, 301: 1309-1314. Zbyszewski G, Candido de Medeiros A, Veiga Ferreira O da, Torre de Assuncao C, 1968. Geologic map of Ihla das Flores (Azores). Servicos Geologicos Portugal, 1:25,000 scale map with 31 p text (in Portuguese). The northern half of the 10 x 15 km wide island of Flores, which lies west of the Mid-Atlantic Ridge, appears at the margin of this NASA Space Shuttle image. 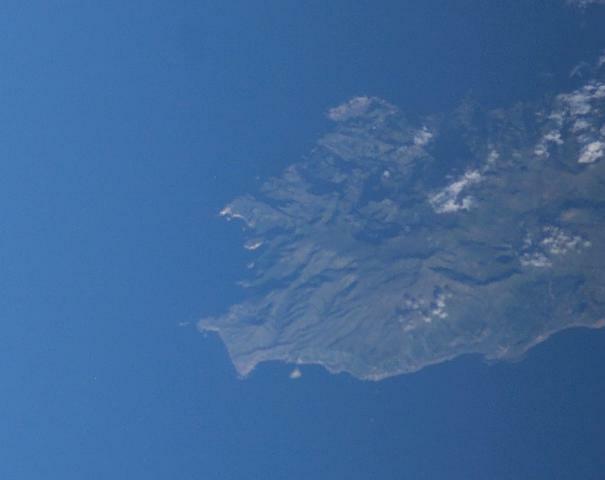 Ponta Delgada lies at the northern tip of the island at the lower left. Several craters seen to the left of the cloud banks at the lower right were formed during eruptions about 2900 years ago that also produced a lava flow that forms the Faja Grande Peninsula below the craters. NASA Space Shuttle image ISS007-E-11252, 2003 (http://eol.jsc.nasa.gov/). Lakes occupy Caldiera Funda de Lajes (left) and Caldiera Rasa (right) on SW Flores Island in this view from the east. The Caldeira Funda de Lajes tuff ring formed about 3150 years ago, accompanied by a lava flow that traveled to the SE, reaching the SE coast of Flores at Lajes. The 10 x 15 km island of Flores is dotted by numerous pyroclastic cones and craters. Photo by Björn Ehrlich, 2007 (Wikipedia). The Global Volcanism Program has no maps available for Flores.